R20 – R25 F four-way trucks have a parking brake that engages automatically when the driver exits the truck, which enables a secure stop on ramps and gradients. The combination of the electromagnetic brake on the drive wheel and the hydraulic brake on the right tandem load wheel ensures precise braking in all driving situations. 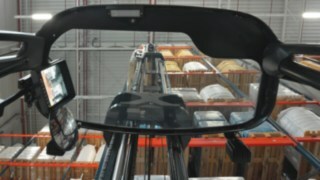 A protective pane made of high-strength, transparent polycarbonate, reliably protects the driver from falling loads while also providing a panoramic view. End position damping gently reduces the end speed during mast forward reach and lifting movements as soon as the maximum lifting height or maximum forward reach is attained. An additional function also means that the truck automatically switches to creep speed from a certain lifting height, so that loads can be safely positioned and picked up. Linde Curve Assist ensures proportional speed adjustment when traveling around bends. 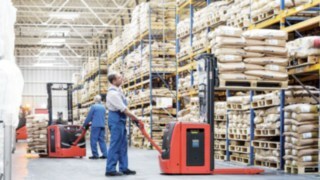 Linde R20 – R25 F trucks are designed with a specific focus on the driver's ergonomic requirements to ensure that drivers can operate without tiring. Individual adjustment options for the driver's seat, the operating console and the base plate height allow drivers to further increase their level of comfort. Intuitive and ergonomically arranged control elements ensure effective operation, while a low cabin entry point with handhold facilitates entry and exit. 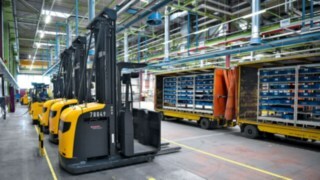 In terms of versatility, the R20 – R25 F four-way reach trucks combine the features of straddle trucks, counterbalanced forklift trucks, reach trucks and side loaders. The intuitive 360° control provides optimum maneuverability. 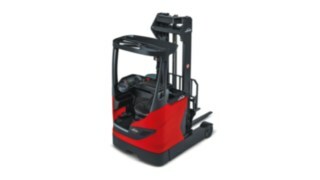 The optional manually or hydraulically adjustable fork distance enables considerable flexibility when handling wide and long loads as well as with standard pallets. 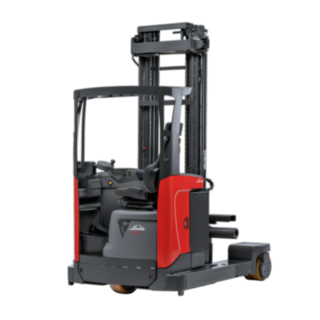 High lift and travel speeds combined with safety features such as end position damping and a display showing load and lifting height mean faster precision handling in the tightest of spaces. 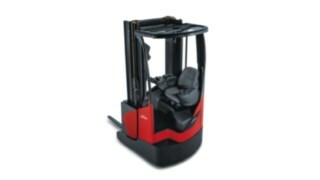 The truck structure has a low center of gravity ensuring high residual load capacities. 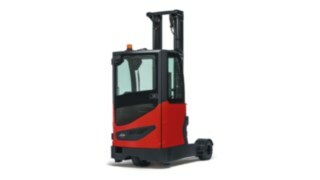 Energy-saving three-phase AC technology enables maximum handling performance. The battery range, graded according to the necessary output, allows the most efficient solution to be selected. This means that the truck can be precisely aligned to specific operating requirements on-site. Trucks are equipped with easily accessible components ensuring extremely fast and efficient servicing. The modern CAN bus connection allows a service technician to export all the necessary truck data to a central location. 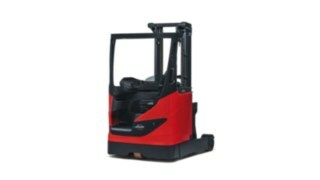 The lift and three-phase AC drive motors are maintenance free. 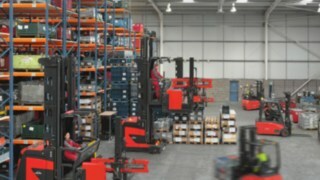 Service appointments are required every 1,000 operating hours. 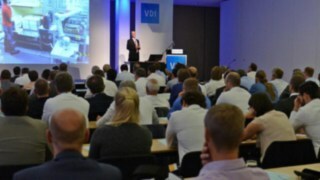 This means that R20 – R25 F four-way trucks are extremely cost-effective and high truck availability is ensured. 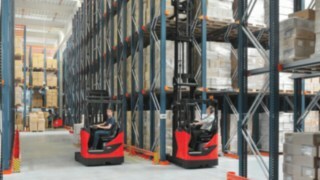 Lift height pre-selection accelerates the operating process, improves work safety and relieves the burden on the driver. The spacious, heated weatherproof cabin ensures optimum comfort, while large windows provide the best possible all-round view. A comfortable PVC seat with extended backrest and inflatable head and lumbar supports increases driving comfort and prevents premature tiring. A camera with color monitor facilitates sideways driving for the driver and increases safety.